Conservatives Of The Upstate: Required to carry insurance to exercise your constitutional right? Required to carry insurance to exercise your constitutional right? The NRA recently provided testimony in opposition to Bill 20-170, the “Firearm Insurance Amendment Act,” sponsored by Washington DC City Councilwoman Mary Cheh. The measure is just one example of "gunowner insurance and tax proposals" being advanced in the governing bodies of several states. B20-170 would require Washington, DC, residents to purchase liability insurance of no less than $250,000 before being allowed to purchase a firearm. The liability insurance policy would specifically need to cover any damages resulting from negligent acts, or willful acts that are not undertaken in self-defense, involving the use of the insured firearm while it is owned by the policyholder. If passed, the proposal would require individuals who currently possess firearms in the city to purchase liability insurance within 30 days of its effective date. • Insurance companies don’t seem enthusiastic about the proposals. • It is economically discriminatory— insurance is expensive and such a mandate could make firearm ownership even more unattainable for the average law-abiding DC residents who have an inherent right to self-defense regardless of income. • No insurance company will write a policy to cover the intentional or criminal misuse of a firearm, whether for a national or a state law. The insurance proposals are matched by another threat: States and cities across America are pushing for higher taxes as a way to enact gun and ammunition control legislation. Gun buyers in Chicago started paying a $25 tax on firearms recently, under a county tax law that is expected to bring in some $600,000 in new revenue annually. Other jurisdictions around the country have pushed measures that would tax firearms and ammunition, as well as require gunowners to purchase insurance. Liability coverage is designed to protect against accidental damages, most of which involving guns would be covered under a homeowner’s insurance policy. 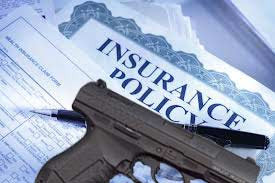 While some policies may provide coverage for liability stemming from the intentional use of a firearm for defensive purposes, no liability insurance product covers intentional acts of malicious violence, whether committed with a gun, a car, or any other instrument that is used as a weapon to deliberately harm people. Maybe one day you will have to buy insurance for political correctness. Paula Dean coulda used that policy.